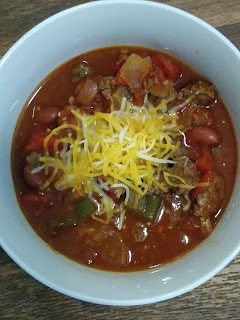 Making chili in a slow cooker is an easy way to make chili. Low and slow, the beef and beans have time to marry together. Perfect and hearty meal. Delicious! We enjoy beef chili. Beef is low in fat than most beef dishes and the beans are high in fiber. I used kidney beans. You may use black beans, white beans or navy beans. Brown the beef before adding to slow cooker. It adds flavor. I serve chili with cornbread. Click here for an easy cornbread recipe, or use your favorite cornbread recipe. In a skillet over medium heat, add ground beef, salt, pepper and worcestershire sauce. Crumble beef as it cooks, cook until no longer pink. Transfer cooked ground beef to slow cooker. Add remaining ingredients except cheese. Cover, and cook on low for 6 hours. Garnish with cheese, if desired. So hearty and flavorful, Christine! I could happily eat it not only for dinner or lunch but even for breakfast! What a tasty and simple recipe! Thanks Chrstine! I never met a bowl of chili I didn't like! Yummy!